GovReady Q Compliance Apps can be updated with information gathered from live systems via the GovReady Q API. The benefit of this capability is that the documentation produced by GovReady Compliance Apps, such as System Security Plans (SSPs), can be assembled and updated with actual system data in an automated way. The GovReady Q API provides read and write access to the information stored in GovReady Q’s question-and-answer data model. It is a RESTful API using HTTP GET and POST requests, API keys that are issued per user, and JSON for request and response data. Each GovReady Compliance App provides a separate API, and each app’s API is composed of fields for the same information the app would ask an end-user using the Q website in a web browser. The app’s definition of questions to ask the end user (see Modules, Questions, and Documents) also define the data model of the API. As an example, the screenshot below shows a demonstration of a macOS File Server compliance app. The app asks questions about the hostname of the server and the use of security groups. adm</code> (2 users: <code>syslog</code>, <code>user</code>), ..."
The second question, shown below, is a yes-no question. In the web browser this question appears as a radio select question with Yes and No choices. In the JSON data structure, shown above, it is encoded as the JSON strings "yes" or "no". To use a compliance app API, an app must already be started in GovReady Q by adding it to a project folder and its modules must be started (but need not be completed) for them to be accessible from the API. The read-only API key gives external tools the ability to see all data values that the associated user can see on Q, but the API key cannot be used to change any data values. The read-write API key gives external tools the ability to see and make changes to anything the associated user can see and make changes to on Q. The write-only API key gives external tools the ability to make changes to anything the associated user can make changes to on Q but does not include the ability to see any data values stored in Q. The write-only key is useful in situations where the external tool needs to be able to upload data but does not need to read existing data values. The complete URL can be found on the API Docs page for a compliance app that has been started and added to a project folder. An API key must be passed in the HTTP Authorization header. You can get your API key from the API Keys page, which is found in the site header menu in the user drop-down. The API response is a JSON data structure similar to the example above. The schema of the response object is documented on the app’s API Docs page. Further information can also be found below. In each of the key-value pairs submitted in the POST request, the key is a dotted-path question ID. The key always begins with project. and is followed by the property names on the path to the question being updated, according to the JSON data structure, with property names separated by the . character. The value of each key-value pair is an answer submitted either as plain text or, for file-type questions, as a binary file. If submitted as plain text and the question expects non-text data, such as a number, the value will be converted. When uploading a binary file, the multipart/form-data content type must be used for the POST request. As with the GET API, an API key must be passed in the HTTP Authorization header. An API key with write permission must be used. You can get an API key from the API keys page on your Q site. For a file upload, use -F @filename.ext. curl&rsquo;s -d option can be used in place of -F if none of the fields are file uploads. Use a POST request instead a GET request to the same URL to update data stored in the app. Data values to save in the app are included in the request body as JSON in the same format as returned by the GET request. Answer data is placed inside the project field. 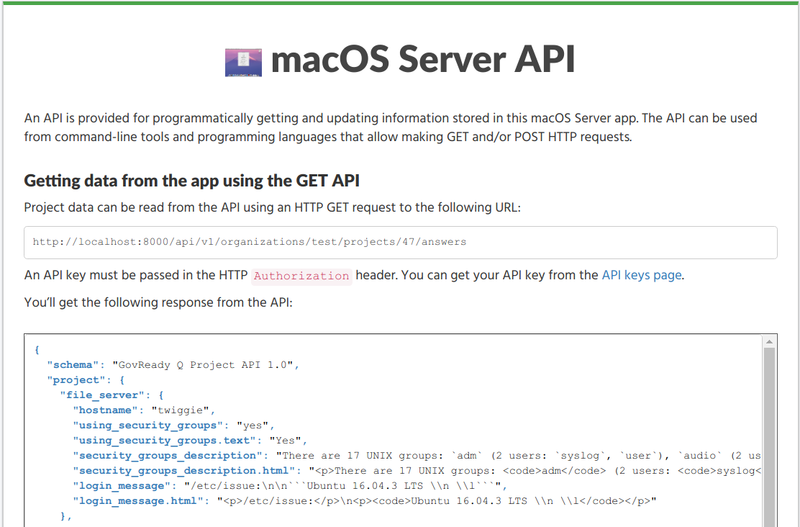 As with the GET API, an API key must be passed in the HTTP Authorization header. An API key with write permission must be used. You can get your API key from the API Keys page, which is found in the site header menu in the user drop-down. Each compliance app documents its data schema on its API Docs page, which can be found inside the compliance app after it has been started and added to a project folder. Text, password, email-address, and URL fields: Encoded as a JSON string. Email-address fields must contain valid email addresses. URL fields must contain valid URLs. Long text fields, which hold multi-paragraph text: Encoded as a JSON string with formatting expressed in CommonMark (i.e. Markdown). Date fields: Encoded as a JSON string in YYYY-MM-DD format. Single-choice and yes-no fields: Encoded as a JSON string holding a programmatic identifier for the selected choice. Yes-no fields use the identifiers yes and no. Multiple-choice fields: Encoded as a JSON array of strings, where each string is a programmatic identifier for a selected choice. Integer and real number fields: Encoded as a JSON number. Integer fields must contain integer values. File fields: Encoded as a JSON object containing the properties url (a link to download the file content), type (the MIME type), and size (the size of the file in bytes). “Module” questions create recursive structures and are encoded as JSON objects. “Module-set” questions are encoded as JSON arrays of JSON objects. All fields can also hold null, which indicates the question has been explicitly “skipped.” If a question is unanswered, it does not appear in the API. Single-choice, multiple-choice, and yes-no fields also appear in human-readable form as a second read-only field that uses a .text suffix in the field’s name. Long text fields have an HTML display form, in which the CommonMark is pre-rendered, in a parallel field with a .html suffix in the field’s name. These fields cannot be used in the POST API. More information about Q’s data types can be found in Modules, Questions, and Documents.